Welcome to my new website! I had been putting off making a web site for a year now, making lame excuses and diligently procrastinating. But now, thanks to the help of some good friends and a little time off, I finally have annamariezmolek.com up and running! So far I have my bio, resume, photos, calendar, some sound and video clips, press, and this delightful little blog thing. I hope to update often and keep things interesting, so check back, join the mailing list, and enjoy! 2012 has been an amazing year for me so far! In March I sang on the Metropolitan Opera stage as a Semi-finalist in the National Council Auditions, which was both a terrifying honor and an extreme pleasure. 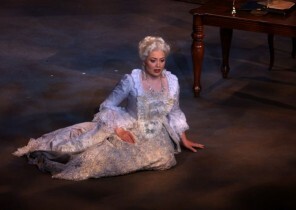 Just one week earlier, I had the privilege of singing my first Violetta with Opera Theatre of the Rockies. It is a dream role that I had long hoped to portray, and to sing it in my home state with people I love in the cast and chorus was an absolute joy. This season has brought concert debuts in Vermont (Green Mountain Opera Festival), Florida (Seraphic Fire), and Louisiana (Lake Charles Summer Music Festival), three states I had never previously performed in. It is a really exciting time, and I am enjoying the music, grateful for the wonderful people I have met, and so happy to be doing what I love.